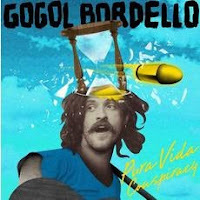 It's safe to say that there are few, if any, bands who sound like Gogol Bordello. The NYC-based gypsy punks will prove that again when they release their new studio record, Pura Vida Conspiracy, on July 23rd. The band don't fool around. The opening cut, "We Rise Again", puts you on notice by setting the mood and the tempo for what's to follow. The roots of the band can be felt throughout. Whether it's the oom-pah of "Dig Deep Enough" or the fiddle that leads the infectious rhythm of "Amen", the Eastern European heritage is on full display. As strong as the World music influences are, Gogol Bordello are equally influenced by punk rock. A track like "Lost Innocent World" is really just a hard-rocking punk number with high-octane fiddle layered on top of it. "Gypsy Auto Pilot" is pure energy. Everything comes together to peak with "Name Your Ship". The tune has a strong hook delivered in the form of a sea shanty, all the while staying true to the punk ethos. The vocal limitations become apparent when things get slowed down. Songs like "We Shall Sail" and "Maladrino" are tough to listen to because of that. There's not really even any kitsch value to it. It's worse on "I Just Realized", which combines those shoddy vocals with dull lyrics and a nothing accompaniment. Nobody who has heard Gogol Bordello should be shocked by what they hear on Pura Vida Conspiracy. If you dig there previous work you will undoubtedly be into this record too. Just remember, there are some moments that make you reach for the skip button. Gogol Bordello play the Danforth Music Hall in Toronto on August 19th & 20th. Best tracks: "Name Your Ship", "We Rise Again"